TSC stands for Teacher Service Commission is an independent government body to manage the human resource within the education sector. It was established in 2056 BS as National Teacher commission. Later on, it was named as Teacher service commission in 2058 BS. It was established with a motive to make the teacher’s permanent workers who are working in a community school, to promote them at a higher level, to provide them the teacher license, to coordinate with the government regarding enhancing the education quality and teachers ability. You must have valid TSC license to teach in any government school. To obtain a license, you have to pass the exam conducted by TSC. Here is how the result is view online. How to check TSC result? Open a new web tab. It can be any like Mozilla, firefox, chrome or torch. To know your result, click on the link नतिजा which in the header section as shown above. Type your roll no. in the blank section. Check which type of license result you want to know by clicking on the drop down menu just right to the section where you enter your roll no. 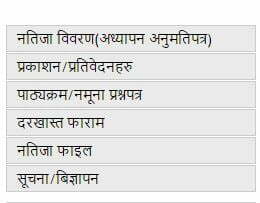 Similarly, to view the result based on district, click on the button जिल्लाका लागि. This is on the right side on the top corner as shown in the figure above. Now, you will have different options to choose. Select the नतिजा छान्नुहोस् and select from the drop down menu the result you want to know. Select your district by clicking on जिल्ला छानुहोस. A drop down menu will appear and choose your district. Select your level by clicking on तह छानुहोस from the drop down menu. Select your subjects by clicking on बिषय छानुहोस from the drop down menu. Click on the button नतिजा डाउनलोड गर्नुहोस and you will get your result. How to download model question? First, open the TSC web homepage as described above. To get model questions, click on पाठ्यक्रम / नमुना प्रस्नपत्र. This is on the left sidebar of your page as shown in the figure below. Now, you have to choose which level of model question or syllabus you want to download from the category as shown in the figure. After you find your category, there is डाउनलोड गर्नुहोस on the right side of that category. Click the link. Save it to your desktop and you will get your model or syllabus in pdf file. Open the pdf file which you have saved. Remember that those who have been selected for the interview can see their total marks they have obtained. For this, they should simply click on Total Marks Publication. Then, you have to enter your roll no and date of birth along with your area code. Then click on खोज्नुहोस. And you will get your marks.